Austin: Nick A. Olivero/Brian Trybom (alternating). Saul: Donald Currie. Mom: Adrienne King/Katja Rivera (alternating). Sam Shepherd is a towering figure in American theatre and film. As a playwright he has won 10 Obie awards, a Pulitzer Prize, and been nominated twice for a Tony. As a film actor, he has won an Academy Award and been nominated for both a Golden Globe and an Emmy. He has had an astonishing career. In the 1970s, Shepherd was playwright-in-residence at San Francisco’s Magic Theatre (still going strong), which staged a series of extraordinary Shepherd plays including Buried Child, Fool for Love, and True West. Shepherd’s brilliant, intense, often physically and emotionally violent plays are not always crowd-pleasers but they are much (and deservedly) admired by both actors and critics. Few professional actors receiving their training at any time since the 1970s have failed to perform multiple examples of Shepherd’s work. There is nobody quite like him. As part of its current season, Boxcar Theatre has taken on the daunting task of producing a series of Shepherd’s plays in repertory: True West, Buried Child, A Lie of the Mind, and Fool For Love. Additionally, they plan to present several additional Shepherd plays throughout the month of March in formats ranging from staged readings, selected scenes and fully finished productions. This represents a rare opportunity for theatregoers to make an in-depth exploration of the work of a single contemporary playwright by a company known for high-quality work. It is the sort of offbeat, wildly ambitious, experimental project that makes the San Francisco theatre scene exciting, dynamic and culturally important. It deserves our support. On January 19, I attended a preview performance of the first play in this monumental project, True West. As expected, Boxcar produced a bang-up production, highly original and superbly performed. 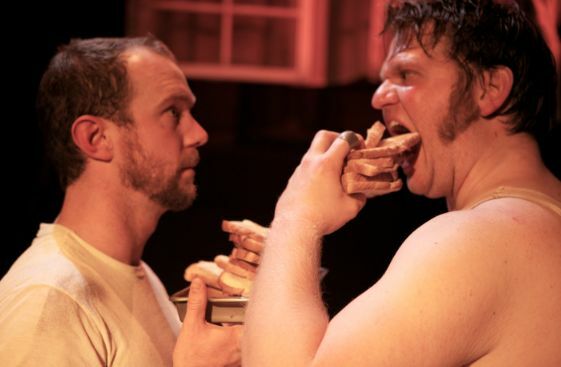 Brothers Austin (Brian Trybom) and Lee (Nick A. Olivero) in Boxcar Theatre's production of Sam Shepherd's "True West". Photo credit: Boxcar Theatre. True West stages the encounter of two brothers, one a successful screenwriter and one a drifter and professional burglar. Austin (Nick A. Olivero), the screenwriter, is caring for their mother’s very nice suburban home while she is traveling. Brother Lee (Brian Trybom) shows up unexpectedly. In the course of the next few days, all the family demons come out to play as the brothers confront their history and the damaging emotional legacy of their alcoholic father. By the end of the evening, this legacy has reduced the mother’s home almost to rubble, but the two brothers have, perhaps, begun to grow up together. It is a devastating play, full of emotional and physical violence and the Boxcar company delivers a rendition that explodes like an overturned tanker truck. Interestingly, there is no credit for direction, merely a statement that the company has worked collaboratively. The result is a close-knit ensemble that seems to read one another’s minds. The tiny theatre (it seats less than 50) suits the material well. The entire space is transformed into the suburban home, with much of the audience seated literally against the walls of the very convincing set. The strikingly polished fight choreography of Durand Garcia makes the violence frighteningly real. In this production, the full force of Shepherd’s vision hits like a hurricane. I should mention that, in true repertory fashion, the cast changes on alternate nights, with the two main actors switching parts with one another. Live theatre doesn’t get more intimate than this. It is a unique experience, highly recommended. For further information, click here. Posted in Reviews.Tagged Adrienne King, Bonnie Robertson, Boxcar Theatre, Brian Trybom, Donald Currie, Duran Garcia, Katja Rivera, Max Pierson, Megan Lush, Nick A. Olivero, repertory, Sam Shepherd, San Francisco Theatre Reviews, Stacy Stagnaro, True West.